inCiderJapan G.K. and Authentic Cider have announced a strategic partnership to help Japanese consumers get access to fine British cider. inCiderJapan has a unique understanding of the Japanese cider market and wide-reaching connections to consumers and their growing appetite for international ciders. Authentic Cider combines Asian distribution experience with strong connections to English and Welsh cider makers. Their partnership creates an exceptional go-to channel for the best of British cider in Japan. The cider industry is undergoing a renaissance globally and demand for cider in the Asia-Pacific region is projected at 6.5% CAGR through to 2024. In Japan and across Asia, consumers are demanding high-quality artisan cider with excellent provenance and good credentials. People are discovering cider for the first time and learning that it is a drink with rich tradition and heritage but also one with thoroughly modern twists. Many of the world’s finest ciders are produced in the UK by makers who are driving the growth of both traditional and more contemporary interpretations of classic ciders. Today’s British cider includes méthode champenoise cider, pétillant naturel and other ‘natural’ ciders as well as ice cider, innovative co-ferments with beer makers and wine cross-overs. The UK is also home to the world’s most important perry makers. By partnering with Authentic Cider, inCiderJapan creates a solid link with UK cider makers as well as builds a bridge between said makers and Japanese consumers. As cider specialists, inCiderJapan and Authentic Cider have a shared goal to educate people about cider and help them understand this distinctly special drink. “We’ve been successful in opening up new markets to cider makers in Hong Kong and educating Asian consumers about the delights of artisan cider from the UK. Many drinkers have heard about cider and are keen to learn about proper artisan cider and to try all the different types – there’s so much diversity. It is fantastic to be able to bring this to Japanese consumers too.” – Jeremy Stunt, accredited pommelier (cider sommelier) and founder of Authentic Cider who specialises in exporting English and Welsh cider to Asian markets. Trend or Tradition in Cider Land? The northern hemisphere is in the full blast of summer now. In the English countryside the lush green of early summer has been burnished golden brown. Everywhere is dry; so different from our Hong Kong weather! Apples are fattening up like these Somerset Redstreak beauties from Perry’s Cider, but many orchards have had little or no rain for almost two months. Earlier this year, cider makers were saying the trees might take a rest after the decent apple harvests of recent years. But the lack of rain is creating even more stress. Trees usually shed some of their apples in June but some makers reported more lost fruit than normal. Quite a contrast from cider makers wintering in the southern hemisphere. As with wine makers, seasonal variations are important for cider makers too. But not so much for industrial producers who churn out many batches a year using concentrated apple juice sourced from all over the world – often China. Additives are used to keep the taste constant. Industrial cider manufacturers make over 90% of the UK’s cider and, as fashions change, they jump on the next bandwagon. Right now they are turning to non-apple flavours, calling the drinks “cider” to give credibility with consumers. Distillers have joined in too with Jack Daniels (tastes “like a student halls drinking game”) and Smirnoff (“disgusting”). The beer industry is also in the midst of the alcopop fruit frenzy fad. In Hong Kong we now have Strawberry Milkshake IPA. The brutal impact of is now being felt in the Herefordshire heartlands where Heineken is paying for cider orchards to be bulldozed. Meanwhile the cider industry rages on about “craft”. I had the recent misfortune of tasting a cider called Orchard Thieves. Heineken have an artfully written marketing story. “A taste so effortlessly drinkable, it can be enjoyed from the first sip, the first aroma.” Not to my palate. This was a generic “meh” attempt at the vaguely west-countryish mass market. It’s very rare that I won’t finish a pint of cider but this was effortlessly undrinkable. Orchard Thieves is cynical craftiness at its best/worst. Heineken says: “Originally coming from New Zealand and domesticated in Europe, Orchard Thieves makes for a great cider, always stealing the best apples for the refreshing and crisp appley taste. It’s as sly as the fox and thus can be found in different markets under different names.” [my emphasis]. In fact, different products can be found in different markets under the same name: Orchard Thieves Raspberry and Vanilla in New Zealand (“craftily worded, oops I mean blended with the sweet taste of raspberry and the smooth finish of vanilla”) and Feijoa and Lime in Singapore. By the way, let me know if you need help with real cider in Singapore. So let’s get back to proper cider. Earlier in the summer my brother and I visited Ross-on-Wye Cider & Perry. The Johnson Family at Ross are the complete opposite of the big industrial producers. Mike Johnson is not only very highly regarded for his cider making but his generosity about cider making seems to know no bounds. He is also an all-round nice guy. The orchards at Ross have an incredible diversity of trees yielding a huge range of ciders and perries, both blended and unblended. Our mission there was total immersion in their very impressive list of single varietals. For educational purposes obviously. We stocked up with supplies from the cider shop and pitched our tent in the orchard by the farm before adjourning to the neighbouring Yew Tree pub for some delicious ham cooked in cider. After lunch and cracking into some of our cider stash, we met Mike, Albert and John at their cider barn for some cider sampling. Industrial cider makers use heat-induced fermentation for fast production. Heineken’s Orchard Thieves mentioned above allows 11 days for the sugar to be converted into alcohol. For them it is critical to process large volumes very quickly. At Ross it is about minimal intervention, letting nature take its course: cider fermenting with wild yeasts at ambient temperatures. This takes time and there are many variables and idiosyncrasies, particularly when using wild yeasts. Traditionally the cider matures in its cask for six to nine months but it can be much longer. I recently enjoyed two 2015 vintage ciders from Little Pomona and a new blend of vintages from 2014, 2015 and 2016 from Oliver’s Cider. We had a very educational time. It's hard to believe it’s June and it’s World Cider Week already. After Hong Kong's scorching May we are in the aftermath of a tropical cyclone leaving us hot and steamy in its wake. But with more tropical downpours forecast for the week ahead we have a very good excuse to crack on with drinking decent cider! The heartland of traditional English cider makers now has that soft and fulsome green that is early summer. In the orchards the apples and pears are showing – hard to believe it was just a month ago that the trees were in full bloom. Cider country is a sight to behold during blossom time. This is also the beginning of the cider festival season. In the Herefordshire parishes of the Marcle Ridge, the Big Apple is devoted to the celebration of English apples, cider and orchards. 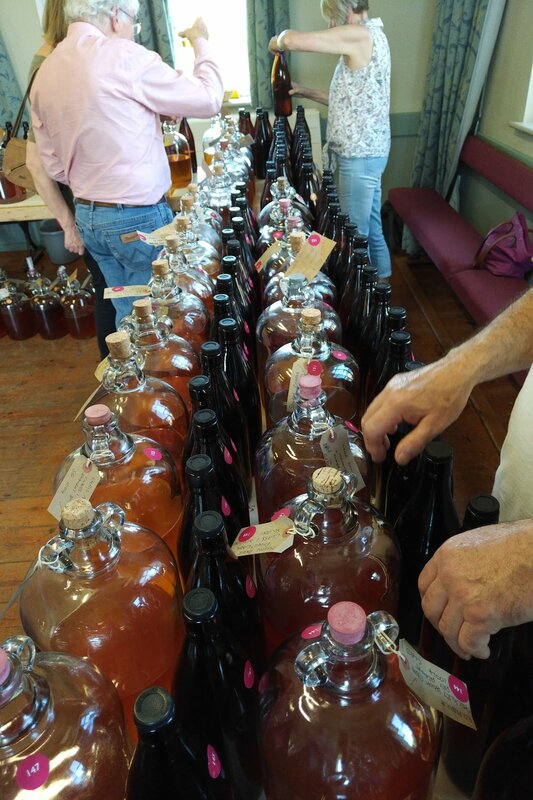 One of their annual highlights is the Big Apple Cider and Perry Trials which have become an important competition for the many independent cider and perry producers in the region and beyond. The day after the this peer-judged blind-tasting event at the Putley village hall, the doors are opened to the public for the annual Blossomtime celebration over the bank holiday weekend. We get to taste a huge range of ciders and perries many of which are quite difficult to get hold of commercially. I was fortunate to be able to try over 20 different ciders and perries (they were small samples honest :D) including most of the winners in each category which included members of the Herefordshire “royal family” of cider makers. It was good meet some of the local cider makers including James Forbes of Little Pomona and hats off to the Bartestree Cider Co for bagging both the Champion Cider Maker and Champion Perry Maker awards. And a big round of applause to Big Apple founder Jackie Denman who has just received the ultimate recognition: a Gold Medal from the Royal Bath & West Show for her Lifetime Contribution to the Cider Industry. The Big Apple folk had organised perfect weather for us and Gabe Cook the Ciderologist led us in an outdoor guided tasting of four distinctly different single varietal ciders and perries. We enjoyed a Dabinett from Woodredding and a Foxwhelp from Bartestree. On the perry front we had Blakeney Red from Pope’s Perry and from Gregg’s Pit I think we had a Thorn (things were getting a little blurry for me by now). Back in Hong Kong, last week I was invited to give some more cider training to my cider loving friends at Second Draft in Tai Hang. They offer customers a wide range of ciders and are keen learners about cider. In January I gave them an introductory cider tasting to contrast different cider styles. This time they got to sample some single varietals covering sharps, bittersharps, bittersweets and sweets. I stock 10 single varietal ciders and perries in Hong Kong and I was able to share a selection with the Second Draft team that included Dunkertons Browns, Breakwells Seedling and Court Royal plus Perry's Morgan Sweet. Best wishes for a healthy and prosperous Year of the Dog. Welcome to 2018 and a new year of cider. As the temperatures plunge in Hong Kong, spare a thought for the sleeping cider orchards. The Herefordshire nights are long and the days are cold in January. The apple trees that gave up their fruit for pressing in the autumn are now resting silently. At the farm the long slow cold ferment of cider is under way. It is a quiet time for the cider makers too. They are tending to their barrels, checking the airlocks. There is pruning to be done and the planting of new trees. But change is afoot: we are past the shortest day and the New Year is here. It is time to wake up the trees. Wassail! The Wassail is an important ancient ceremony. Often celebrated on Twelfth Night, January 6th, it is vital for ensuring a bountiful harvest the following autumn. Celebrants carry flaming torches to the orchard where fires are lit. The Cider Queen places cider-soaked bread into the fork of the tree to feed the good spirits. The Cider King pours cider over the roots of the tree to nourish the eternal cycle of juice to tree to juice. Everyone makes a lot of noise to scare away the evil spirits and to wake up the tree. There is singing, dancing (often with Morris Men), banging of cans with wooden spoons, firecrackers. And much toasting with cries of Wassail! and the requisite response Drinkhail! Then back to the cider house for more cider enjoyment. For it’s our wassail, and a jolly wassail! And my pockets full too. We were very lucky to participate in the 2018 Wassail led by Matt Slocombe of The Crown Inn (UK Cider Pub of the year 2017) in the Herefordshire village of Woolhope. It was great to see the world’s most influential cider and perry maker Tom Oliver too. Cider isn’t just a summer drink. The more tannic west-country style ciders have a robustness that works well in the winter rather like darker ales and red wine. In this weather there's no need to chill them. Mulled cider is a lovely alternative to mulled wine especially if you kick it up with a shot of gin when you serve. And don’t forget these ciders partner well with winter roasts or your hotpot. So wrap up warm for the Hong Kong winter and pour yourself a real cider or two. We bring you premium artisan cider and perry from award-winning makers including Dunkertons, Hallets and Perry's. Keep in touch for even more of the world's best ciders and perries in 2018. Like us on Facebook or follow on Twitter and Instagram. We are counting down to St David’s Day in Hong Kong by focusing on a Welsh cider. 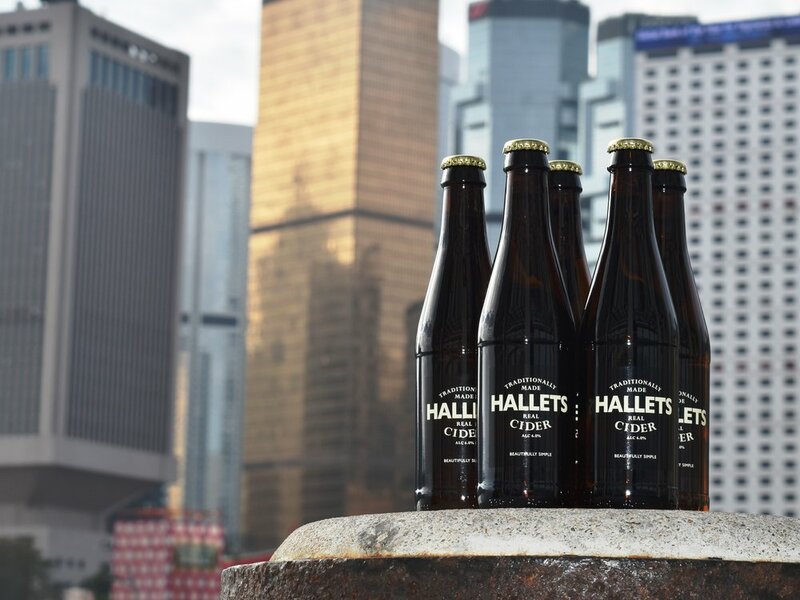 Hallets Real Cider is made by Andy Hallett, an award-winning cider maker whose small farm is in the beautiful hills between the old counties of Glamorgan and Monmouthshire. The unique flavour of Hallets Real Cider is down to Andy’s clever cider-making skills. He uses a traditional method borrowed from the Normans called keeving. This is a slow partial fermentation that yields a sweeter, rich and clear juice. Andy blends this with oak-aged vintage cider to produce a drink with a subtle texture and taste. This cider appeals to wine connoisseurs as well as more seasoned cider drinkers. Hallets Real Cider won Best Drinks Producer in the BBC’s Food and Farming Awards 2016. One of the judges described it as the most beautiful cider she’d tasted, providing serious competition to good wines. Not surprisingly, Andy recommends a good quality Caerphilly cheese with his Hallets Real Cider – after all, his Blaengawney Farm is just up the road from Caerphilly. But it’s an excellent match: the tangy creaminess of good Caerphilly goes well with the cider’s bittersweet apple and the magic from Andy’s barrelling. Andy’s cider works well in (and with) many different dishes. Try it instead of white wine in moules marinières with lashings of cream (and plenty of crusty bread). Hallets Real Cider works well in the base for seafood risotto too. And drink the cider with both dishes. To honour the Welsh leek on St David’s Day, you could make a rich leek soup with a cider-based broth and serve with grated mature cheese. Or for an authentically Welsh side dish with your roast lamb, you could braise some leeks in butter; add some cabbage, cider and seasoning; then wilt everything down. Try Hallets Real Perry too. Enjoy some lightly chilled with a slice of Bara Brith this coming 1st of March. Contact us to order a few cases of Hallets Real Cider and Hallets Real Perry for your bar, restaurant or Saint David’s Day event. The cider and perry are both available in 500ml bottles, with the cider also available in 330ml format. Chill lightly before serving.